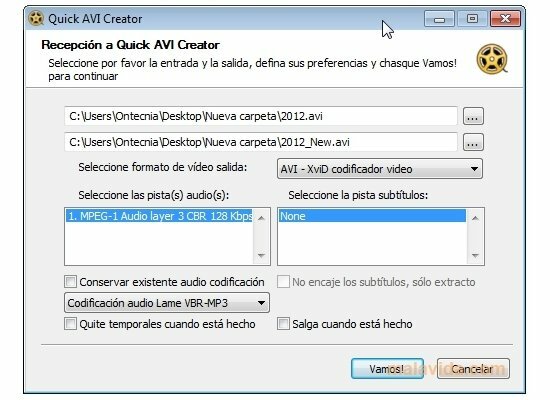 If you need a simple converter to compress the audio or video of any film or to extract the subtitles or encode the audio, download Quick AVI Creator. 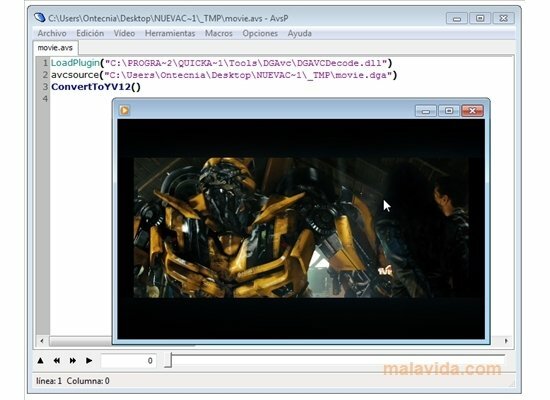 This application uses XviD or x264 encoders to convert your favorite videos to AVI, MKV or MP4. - Convert the format of your favorite films and videos to AVI and MKV, codified with x264 or XviD encoders, and MP4, codified with x264. - Compatibility with DVD, MPEG, AVI, MKV and MP4 input files. - Include up to two audio tracks codified in some of the following formats: AC3, DTS, PCM, MPEG, WMA, AAC and OGG. - Possibility to maintain the original audio chains or compress them using the popular LAME encoder, whether using a variable or constant bitrate. - Support for an internal subtitle track in the case of DVD or MKV, and compatibility with external SRT, SUB and SSA subtitles, among others. - Possibility to include the subtitles in the destination video file or only to extract them. During the installation, Quick AVI Creator allows you to also install Avisynth that adds extra functions to the application (previewing, deinterlace, filters,...).